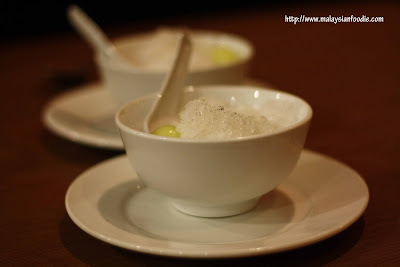 If you are planning for a delighting Thai style meal, you may choose to have them in Just Thai where I can say that the Thai food here is amazing delighting and the place is kind of romantic as well. We had found this simply Thai Restaurant back during the Ramadhan time where me and dear spotted the absolute nice menu for two. This is our first time stepping in the restaurant with Carol. The cutlery set was simply amazing with the nice word Just Thai and I had just take up my camera to snap a picture on it. Is ordering time now. The menu is furnish with many dishes like ala-carte from non spicy to spicy, as well as recommended/ signature dishes will be marked as well. So, as for me and dear we ordered the Ramadhan set which comes with the Basil Chicken Rice Set and a Pineapple Rice Set, a bowl of tomyam chicken, a set of drinks and lastly a dessert. 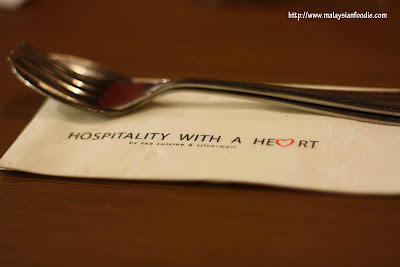 The delighting meal cost us RM 38 before tax for both which is quite a heavy meal as well. 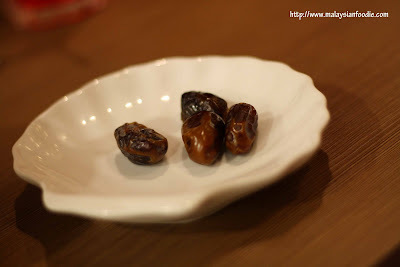 As usual, the meal started up with kurma which is dates in English. This is usually served during Raya for as a meal opener. 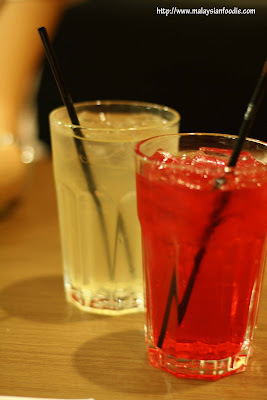 Then it comes with 2 cups of drinks which is one is air bandung and another is a Thai local tea. The drink was simply refreshing as well. Here comes our meal , it started with the spicy tomyam chicken which was simply amazing and delighting. 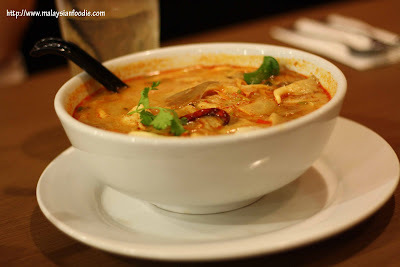 The tomyam can said to be kind of spicy and delighting as well. The taste of the tomyam is not too sour and inside it comes with chicken meat, a bit of mushrooms and some vege like onions and carrots as well. The tomyam can said not too spicy as well. Next comes the pineapple fried rice which I love the most. 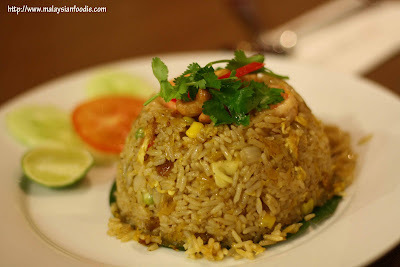 The pineapple fried rice in indeed a lot much more oishi comparable to other pineapple fried rice. Aside of the fabulous pineapple rice oishi taste, the portion is quite big as well. The basil chicken rice was not bad. The taste is nice and it is not much spicy yet it is really temptating. 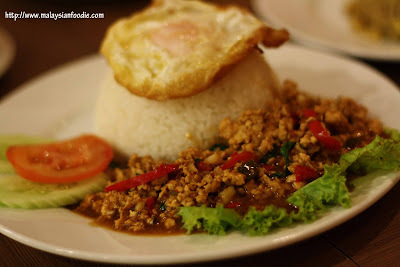 It is cooked with basil and minced chicken meat. Carol ordered the seafood tomyam bihun which is alao a very big plate as well. 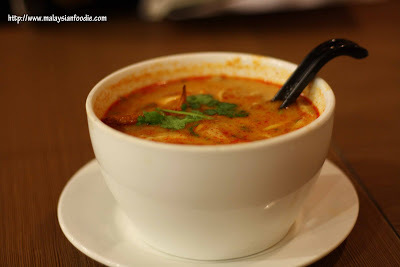 The tomyam bihun is indeed a nice one which it comes with a variety of seafood like squids and prawns. The portion is quite big. But, according to Carol, she said is not as spicy as she thinks of. Prices of food will be added 10% service charges and 5% government tax.